"This is a hearty meal that's easy to make and keeps well. I use a slotted spoon to serve it with rice and sweet cornbread." Heat olive oil in a large heavy pot or a 6-quart Dutch oven over medium heat. Cook and stir onion in hot oil until translucent, about 5 minutes. Break ground beef into small chunks and add to the pot; cook and stir, continuing to break the beef into smaller pieces, until the beef is completely browned, 5 to 7 minutes. Season beef mixture with garlic powder, red pepper flakes, Italian seasoning, and a dash of salt. 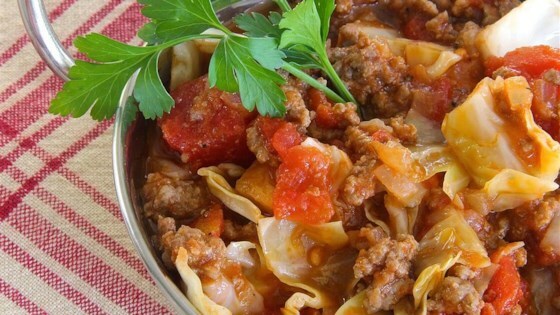 Stir cabbage, diced tomatoes, and tomato sauce with the beef mixture; bring to a boil, reduce heat to low, and cook mixture at a simmer until cabbage is fork-tender, about 25 minutes. Season with salt and pepper. Easy recipe and delicious too. I added beef broth for added flavor. I will be making this again. Thank you for sharing.